Nest Protect, one of the few combination CO/smoke detectors on the market, takes the guesswork out of smoke and CO detection in your home. The app and even the devices themselves tell you what’s wrong and where, and the Protect can integrate with other Nest devices, as well as a few other smart home devices. With its second generation, Nest has rectified many of the issues of the first-generation Protect, and we love its many features that give you an insight into what’s happening in your home. If you want a smoke/CO detector that will send alerts to your smartphone, you’ll need to be prepared to pay three or four times as much per device as you would pay for a regular smoke detector. 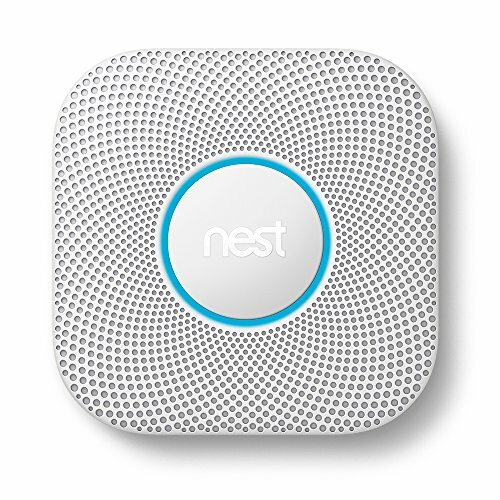 There are only a handful of such detectors on the market, and because of its robust features, quality hardware, and excellent user interface, Nest Protect ranked first in our review of combination smoke/CO detectors. False alarms were a big problem with the first-generation Nest Protect, so in this second generation, Nest has upgraded the Protect from a single photoelectric sensor to a split-spectrum sensor. This improved sensor can better distinguish benign debris such as dust or bugs from smoke particles, leading to fewer false alarms. If you do happen to get a false alarm, the second generation allows you to silence the alarm with your mobile device. Other new features of the second generation are its automatic self-testing, easier installation, and convenient battery access. With all of these improvements, it’s clear that Nest listens to criticism and responds with real changes to its products. Nest Protect is compatible with all other Nest products, Google Home, and IFTTT. It’s not compatible with Apple HomeKit, and linking it up with your Z-Wave or ZigBee devices takes some extra creative runaround. The most important compatibility is with the Nest Thermostat because home temperature and fire dangers go hand-in-hand. When Nest Protect detects CO or smoke, your Nest Thermostat will automatically turn off any fossil fuel-powered heating and forced air systems to help prevent the problems from spreading. Your Nest Cams will automatically record an emergency clip and start streaming video to your cellphone, and any other Nest devices you have in your home will also begin sounding an alarm to help you find the source of the smoke or CO. You could also set up IFTTT rules to flash your Philips Hue lights if smoke is detected. If you have Google Home, you could set up a rule to automatically order more batteries on Google Express so you don’t have to remember to later. Nest Protect is available either as a wired or battery-operated device, and the price is the same for both. I haven’t found a retailer that offers a discount for buying multiple devices at a time, but the Nest store will give you free shipping if you purchase more than one. Should I get wired or battery operated? Be sure to check out your local smoke detector laws to ensure your home is in compliance. California state law, for example, requires hardwired detectors with battery backup in any home built after 1992. If you live in California or you have an existing wired smoke detection system, you might as well go with wired so you don’t ever have to worry about replacing batteries. Battery-powered detectors are good if you have a home without an existing wired system, or if you want to place a detector in an unusual area, such as a garage, workshop, or barn. The Split-Spectrum Sensor adds a blue LED to the standard infrared LED in order to detect different-sized particles produced by different types of fires. It uses the information gathered by these LEDs to “make more informed decisions” about the nature of the particles and how and when to sound an alarm, leading to fewer false alarms. The Steam Check uses algorithms and a humidity sensor to distinguish smoke from steam so your hot bath won’t be interrupted. The device offers early warnings before sounding the alarm. When you’re cooking bacon, a gentle voice will tell you “there’s smoke in the kitchen,” rather than a full-volume assult to your eardrums. The heat sensor detects sudden rises in temperature so the device can investigate. It talks to your Nest Thermostat to turn off the heat if there’s a carbon monoxide leak or smoke in the house. A self-test called Sound Check automatically runs once a month so you don’t have to remember to do it (who does, anyway?). You can also run a manual safety checkup if you need extra assurance. If enabled on your Nest App, Home/Away Assist will wait until you’re out of the house until it runs the sound check so you never have to hear those horrid chirps. Nightly Promise reassures you that your batteries, sensors, and Wi-Fi are all working before you go to bed. A quick green glow when you turn off the lights means everything’s working, and yellow means there’s a problem. If you push the center button on the Protect, it’ll tell you what the issue is and with which device. Pathlight turns on a low light when you walk under the device in the dark (can be disabled). The Nest app controls Nest Protect, so if you already have other Nest products, like the thermostat or cameras, you can monitor everything from a single highly rated app (four stars in both the iOS and Android stores). Nest provides robust online support for the Nest Protect, with installation videos, startup guides, troubleshooting, and FAQs. If these resources can’t solve your issue, Nest is also available on chat, Twitter, or by phone (855-469-6378). I’ve used Nest’s chat feature a handful of times and their representatives are always courteous, helpful, and honest about the product’s limitations, and they never try to spin my inquiries into a sale, which is truly refreshing. Why get a combination smoke/CO detector? Combination smoke/CO detectors reduce the number of separate devices you have to install, plus you can monitor two major environmental threats from one app, meaning you’ll have fewer devices to monitor and find places for in your home. I don’t think I need to throw out a bunch of statistics to convince you that you need working smoke detectors in your home (but in case you were wondering, three out of every five home fire deaths occur in homes without functional smoke alarms). But what about CO detectors? What do they do? Carbon monoxide is a gas already present in the air we breathe, but too much of it can be deadly. Most homes have some sort of fuel-burning appliance (space heater, furnace, hot water heater, fireplace, gas range, etc.). These are designed not to emit unsafe CO levels, but valves get blocked and things break down, so it’s a good idea to have at least one CO detector on every level of your home. Do I recommend Nest Protect? Yes—enthusiastically so. Because I’m already on it all the time anyway, controlling my system from my smartphone also makes a ton of sense. While there are a few products out there with similar features, this device outperforms them all in its hardware, user interface, and customer service. Nest Protect eliminates the worst things about smoke/CO detectors and enhances the best things. Do you have Nest Protect in your home? What do you think of it? What are your favorite features? FYI Nest Smoke/ C.O. Detectors. If you are planning to put these in your home and have an attached garage, DON”T! Ma. fire code says you must have a heat sensor detector in the garage and NEST does not make one, PERIOD! The problem is they all have to communicate with one another and there is not one compatible with NEST. Built a new home, spent $2,000+ to put NEST in and failed the fire inspection. They all have to come out and be replaced because of the garage. ( on page 18, the last sentence, after install instructions) you will find a note that reads, not recommended for attics or garage. All news to my electrician, builder and everyone else I talked to. Nest does not advertise the fact that these CANNOT be used in the garage or attic and you will have to hunt to find it on their web page. BUYER BEWARE! If you have these in your home and want to sell, you will need to replace them if you have an attached garage or you will fail the fire inspection. Now they all must be removed and I will be returning them, more cost and aggravation. No help from anyone at nest. Hey Marcel – Unfortunately not as of yet. Nest is compatible with all other Nest products, Google Home and IFTTT.